All CT Academic Team Winners Announced! Professor Crystal Wiggins and Professor Todd Bryda, both of Northwestern Community College led the award ceremony on Friday, April 29th. Phi Theta Kappa, CT State Colleges, and Universities Board of Regents sponsored this event. 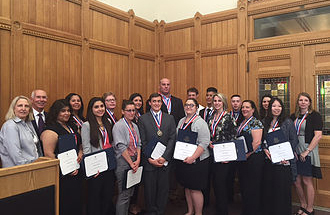 Winners were presented with a medal and certificates from Governer Dannel Malloy, CCSU, and Phi Theta Kappa at the State's Capital. Congratulations! Photo of 2016 CT Academic Team with #CSCU President Mark Ojakian and special guest speaker, Representative Roberta Willis. The President's List recognizes the Top 25 chapters by membership acceptance rate. Kudos goes to three New England Chapters who made the list! HCC Member Meeting turns Epic! 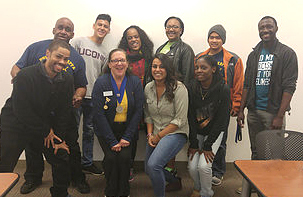 A major "thank you" goes to Renee Dupuis and Sakina Baqar for their sacrifice to travel down from the Alpha Lambda Zeta Chapter at Asnuntuck Community College, (Enfield, CT), to do this event, and add on to the Phi Theta Kappa chapter connection initiative (it's a Chi-Rho thing). Also, "THANKS" to our very own Housatonic Community College President, Dr. Paul Broadie II (He's a Phi Theta Kappa Alum/Phi Theta Kappa National Advisory Committee member) for stopping in to check out the huge turnout today, standing room only. We're going to need a bigger room next time!! "Everyone gets a CHI-RHO Cool Point!" "Leading from the front is leading by example!" After conducting research about problems in the greater community, our officer team of Alpha Chi Nu Chapter of Southern Maine Community College decided to address needs of food insecurity, student engagement, and healthy living. To meet each of these needs, our officer team agreed upon building a greenhouse and donating it to a local public school. The officer team collaborated with a local public school district official to find a school in need and select an appropriate location. Each officer member played a vital role in completing the project's goals. One officer member reached out to a local building supply store and successfully acquired a donation of building materials. The chapter then used its own funds to pay for the rest of the building materials. The officer team initiated communication and collaboration with a local elementary school principal and learned that the elementary school could keep the greenhouse sustainable with the help from its Greening Committee. The officer team reached out to their college's Horticulture program in order to select an appropriate design for the greenhouse. One of the officer members requested the help of a local construction crew to assist with providing tools and help building the greenhouse. 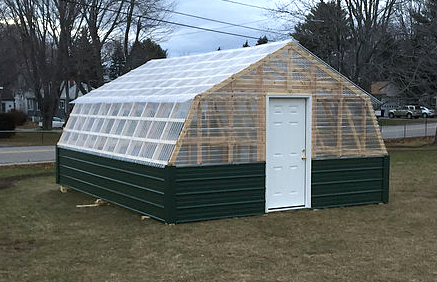 The officer team then set aside three separate days to complete the construction of the greenhouse on the elementary school's grounds. Another one of the chapter officers also coordinated with the Cinema and New Media program at chapter's college to document the whole process from start to finish. The Chapter officer team intends on returning to the elementary school in the spring to teach gardening classes to the elementary students. Hunger among college students is now in the national spotlight and appears to be a growing epidemic. Manchester Community College (CT) has been working to combat this increasing problem by opening a food pantry on campus. In addition to serving our student population by providing non-perishable food items, we are also hosting a career closet for students who may not be able to afford professional clothing for job interviews. Phi Theta Kappa is playing a huge part in this amazing initiative. Chapter advisor, Michelle Nickerson and Director of Student Activities, TJ Barber, have been working closely to make this a reality. Chapter alumni and current chapter members have come together to volunteer their time to help staff the pantry/closet and have participated in sensitivity training to learn more about the effect this need may have on students. The need is real and nothing says service to a Phi Theta Kappa member quite like serving our community this way. The MCC Food Pantry & Career Closet will open on Thursday, January 21st to students in need. The Alpha Upsilon Alpha chapter is proud to be a part of this exciting opportunity.